Sunday pheasant cooking. I have really missed pottering to the butcher and getting a lovely piece of meat to cook. This little pheasy is courtesy of Ginger Pig Clapham and I felt like a child on Christmas Day with the best present. (I once insisted all I wanted for Christmas was a candle and my Mummy dutifully bought one, along with some other presents she thought I might like. The candle triumphed and I was so happy with my special present, nothing else got a look in! Thank you Mummy!) Even though I had a meat feast on Friday night, it didn’t hit the spot in the way I had hoped. The process of slow cooking this little bird all afternoon, luxuriating in the smells circling my kitchen has made my dinner worth the wait. For me, food has to be loved, and made with love to be really appreciated. 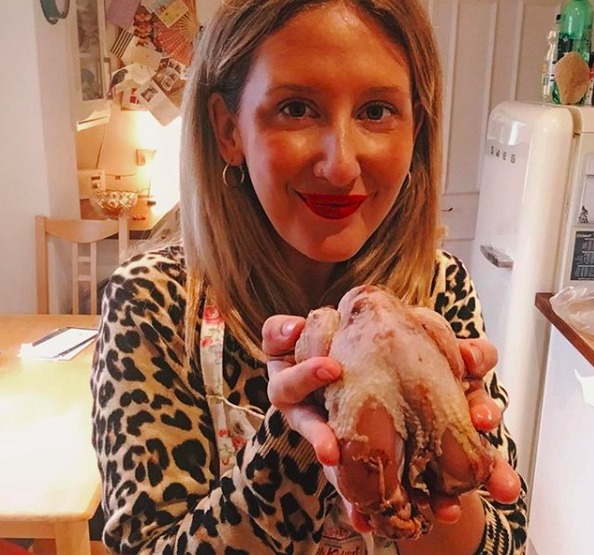 I invited my sweet neighbour round and we sat at the kitchen table with a glass of red wine and shared the pheasant love. It’s quite hard to get your head around the fact that the big fat pigs trotting around in the orchard actually started life at this size. I woke up this morning panicking that something might happen to them. We’ve been very lucky so far with no escapees and no sickness, but it got me thinking about the fragility of life. When an animal is so small and reliant on their mother, this fragility is easy to understand. Once they turn into big grunting beasts however it makes it much easier to forget, but they’re still dependent. On us. It’s up to us to make sure they have nice clean fresh water, yummy food, a warm bed, enough stimulation to keep them happy...and yet something could still go wrong. One of them could get sick. For the first time I am really understanding how heartbreaking it must be for a farmer to lose their animals. All the work you have put in to keep your animals alive, happy and thriving can suddenly disappear. It’s the destruction of a deep nurturing for their livelihood to provide your livelihood. This dependency on us is down to our success, being at the top of the food chain. We don’t often think about this as we get stuck into a roast chicken or a burger, but it’s something I want to bear in mind a bit more. Most of these animals are dependent on us, and it’s our choices that determine their lives. Well the hair on these piggies has grown significantly thicker since the cold weather started. Such hairy beasts! Really looking forward to getting back to the countryside for a good amount of time over Christmas - starting to feel a little claustrophobic in London. There’s an overwhelming feeling that we must consume, consume and consume. Whether it’s buying things we don’t need or eating and drinking more than usual and in London the constant bombardment of advertising and marketing is making me feel a bit stressed. I’m all for having treats at Christmas, getting slightly too merry after one too many glasses of wine and indulging in a few extra mince pies. But I can’t wait to look out of the window and see fields instead of supermarket logos and buses smothered in branding. And maybe that’s because it’s easier when you look out into the natural, unadulterated countryside, to think about what you really want and need. As much as there is some fear about taking the pigs to slaughter, I’m really looking forward to the butchery side of things. 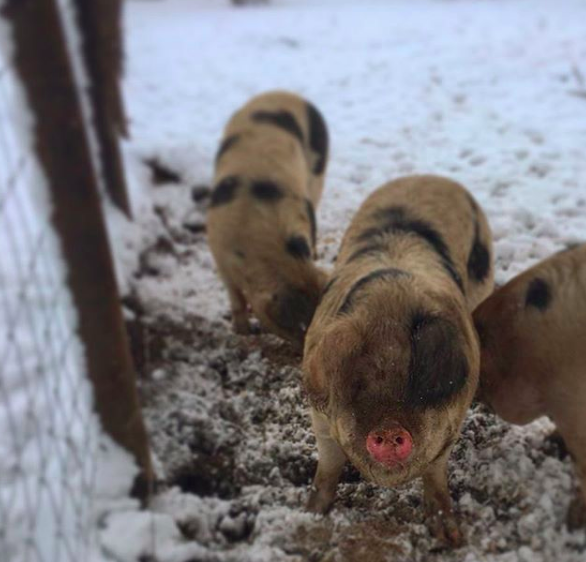 We will be getting the pigs back in half and then taking them to a nearby butcher who will work with us and help us to get all the cuts we want. 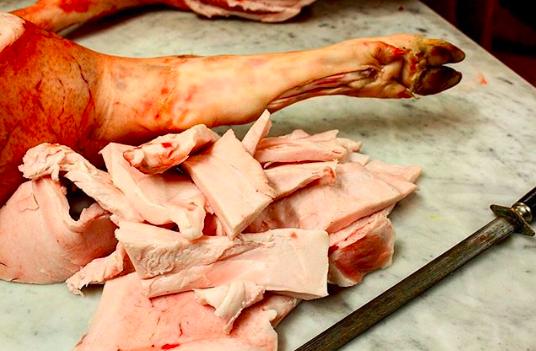 When I first encountered a dead pig in Italy I was keen to get involved but still had some apprehension about picking up its severed head to put into a saucepan. Following on from that I ate all parts from the head including a very recognisable tongue. On the last day we were offered fresh blood to try, so never one to turn down trying something new I stuck my finger into the bucket of red, warm liquid. I can honestly say it tasted like the most delicious black pudding I have ever eaten. Just because things are more familiar in their original form, does not make them any less delicious. We shouldn’t have to form things into different shapes to make them more palatable. Why do we need ham in the shape of a bear? Of course it’s more tricky to get our heads around, but I feel it’s better to try than to bury our heads in the sand and really have no clue what we are eating at all. Today I went to feed the piggies and their pen was an absolute mud fest. It really didn’t make me happy and for the first time I had the feeling that we were keeping them in an environment that wasn’t making them happy either. I took no pleasure in wading through the mud to check their arc was still clean and dry inside and realised we needed a Plan B. I’ve already been having nightmares about getting the trailer in close enough, but with this mud there is no chance. So I hopped to it, and went and got some more fencing under the guidance of Sissinghurst Pigs (thank you a million times 🙏🏼) who also gently reminded me that our pigs are luckier than most. I had probably lost sight a bit of this, and as much as I’m worried about how they might be feeling, I know it’s nothing compared to how a caged, factory farmed animal would be feeling on a daily basis. It’s a very good reality check, and as always has made me even more uneasy about eating any meat without knowing exactly where it has come from. The most beautifully aged pancetta covered in a good layer of fat and spices to keep it perfectly preserved. Every time I walk into a curing room with its intense musky smell that penetrates right into your nostrils, I feel a sense of wonder. These age old methods of preserving meat once served as a way to make it last longer, when we couldn’t rely on fridges and freezers. I think there’s something so primitive about this process that draws me in, along with smoking - another preservation method. In a fast paced world where convenience is king, there’s a charm to old methods and traditional techniques. Who doesn’t love picking blackberries and with sticky black fingers triumphantly carrying your basket of loot home to make a crumble? Or using up all those leftover fruits and veggies to make chutney and jam? For me, the same applies when it comes to preserving meats. Although there’s a lot of talk of ‘processed meats’ being carcinogenic, I think I’d rather have my own pork that I’ve preserved myself, than anything else. This little chicken liver fascinated me. I held it in my hand like a treasured jewel and watched as the light glistened across its crimson surface. We’ve heard of nose to tail eating when it comes to pigs, but I’m starting to feel it’s important to remember this ‘whole animal’ mentality whenever choosing any meat. To be a responsible meat eater I feel I must value not just my favourite cuts but all the other parts too. We have decided ‘breast is best’ when it comes to chicken and we often tend to leave the rest of the bird. This way of eating has impacted the way birds are bred and raised and has led to an industry that has focused on producing large breasted chickens - to the detriment of the animals, the farmers and us as the consumers. But by enjoying all parts of the bird (or any animal for that matter), we expand this myopic vision of what makes good eating, the benefits of which extend to every link in the food chain. For me it’s an exciting challenge, seeing if I can cook something new, and create something delicious out of these lesser used parts. We can (and must) value these delicious other bits just as much as the bits we know and love.